Leyland Line's Colonian built by R. & W. Hawthorne, Leslie & Co., of Hebburn-on-Tyne, and was launched in July 1901 and entered service later that year. 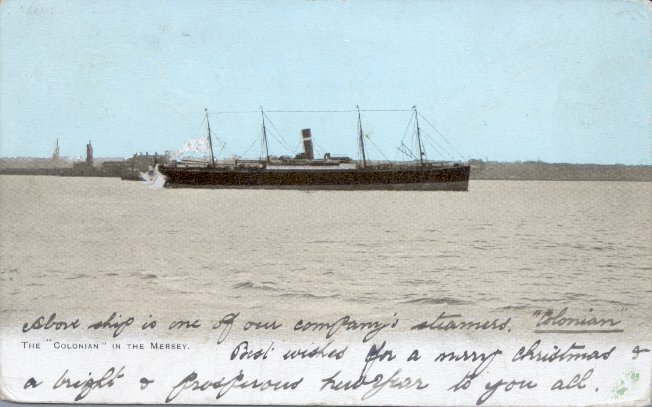 She spent 1902 in the service of the Dominion Line, making eight Liverpool-Portland, Maine, roundtrips; while in Dominion service she could carry 60 First class and 350 third class passengers. Colonian reverted to Leyland Line service in 1903 and was primarily a cargo carrier for Leyland with only limited passenger accommodations. On 21 May 1917, Colonian was wrecked on Bishop's Rock while en route from Boston to Liverpool.